Celebrating over 25 years of Take That! 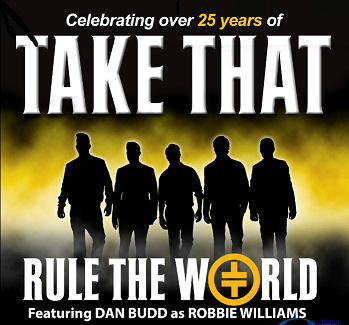 Now in its 11th year touring, the award winning ‘Rule the World’ has been recognised as the Number 1 ‘Take That’ tribute show in the world! The night features all the biggest hits including Never Forget, Greatest Day, Back For Good, Relight My Fire, Could It Be Magic, Shine, Pray, Rock DJ, These Days, Let Me Entertain You, Everything Changes, It Only Takes A Minute and many more.